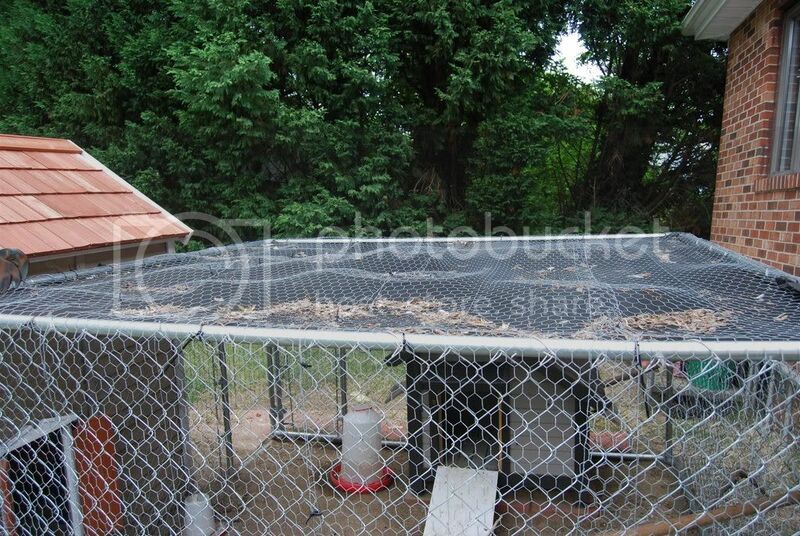 And this is their coop - - spoiled girls! This coop was rather easy to construct - but took a lot of bargain shopping. First I purchased an 8 ' x 8' dog pen from Petsmart - for $79 - I found the matching sun cover on Ebay for $35. at the bottom of the pen, I wrapped chicken wire from the bottom, up the side, over the top and down the other side - leaving a 2' skirt on each end. NOTE: there is a 2' skirt made out of chicken wire around the entire pen. The skirt is held down with landscaping metal tacks and then 12" x 12" landscape pavers are on top of the skirt -- NOTHING is getting in here. I also added various perches made from dowels or old sticks. Now for the coop -- I have no plans -I took the easy way and bought a playhouse from Lowes. It works out perfect - and the girls love to lay their eggs in there because it is dark - and well - it's also cute and I live in a waterfront community so it needed to stay cute! I also hang the feeder from the roof so it stays dry. The bottom of the play house has chicken wire under neath it and also has the 2' skirt. I added hardware cloth to all the windows and latches on the doors so it is secure. They have a doorbell too - but no one uses it! The entire play house is on 16" x 16" lanscape pavers and the inside is filled with biodegradable horse stall pellets to keep things extra dry. I have a nice nesting box inside - that wasn't cheap - but no one uses it and they all prefer an old milk cartons. I also added perches as well. I took one of the wall panels of the playhouse and turned it upside down so that the window is now the door for the girls - and I can shut it should I need to. The door leads to the enclosed pen via a ramp that is actually dolly ramp. The grey house is actually a dog house I purchase for them when they were little but they quickly grew out of it but enjoy roosting on top of it during the night -- I'm considering moving it outside and adding another opening in the pen to give them more room and put their food in there instead and adding another nesting box in the playhouse. The entire garden has a chicken theme - including the bistro set -- "Starclucks Coffee" that I created with a graphics program and had made - it's actually a car door magnet that I had shaped to fit over my old bistro set! The plan is to have this area be one big butterfly garden and the area with the bistro set will be filled in with flag stone, mulch, etc. It might not have been made from scratch -- but it's a very cute coop! Hey, I ran across your coop looking for a playhouse to chicken coop conversion! Looks amazing! How did you close in that large opening in the back? Also- do you remember the name of the playhouse? I ran across one called a Barryberry house that looked exactly like yours but it does not have the split door. I think the split door would be handy for feeding the girls. Thanks for your post, absolutely love how it turned out!